Two coats of Nicole By OPI Gumdrops Collection Cinna-Man of My Dreams. Finely Textured Red / Brown Shimmer. If you're seeking unique, Cinna-Man of My Dreams is it. From afar, it looks like a red / brown / cranberry-based shimmer; but it is so much more. Up close you can see that it is packed with red, gold, and blue micro-glitter that gives it this gorgeous fall effect. Formula was perfect - opaque, self-leveling, non-scratchy, and full of depth. To note: The shades in Nicole By OPI's Gumdrops Collection are similar to those found within OPI's Liquid Sand Collection with the exception that the Gumdrops texture is more finely-milled. 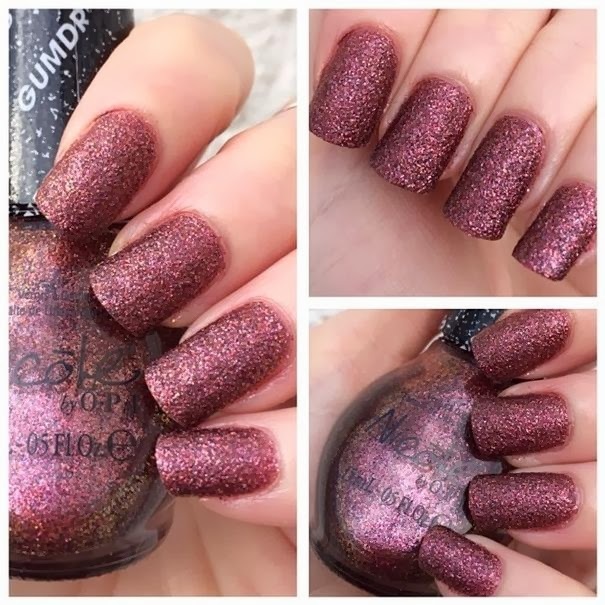 So if you aren't crazy about how textured the Liquid Sand Collection is, you may really love the Gumdrops offerings. Oh so lovely! So great to get your review. Still into the brown tones here. Maybe I'll go red and pink next month. Love this. So pretty. Great Monday post! Awesome Monday post! Great color and texture! So great for February too! Totally in love with this colour, looks sublime! I enjoyed reading your thoughts on my last post, thank you! lol! The name is *almost* as cute as the polish! Love! OMG that colour is incredible!